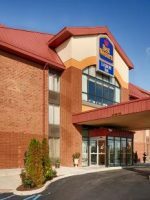 This full-service hotel is ideally located in downtown Fort Wayne and only steps away from the Tincaps Minor League baseball stadium, Parkview Field. Better yet, it’s connected to the Fort Wayne Convention Center. 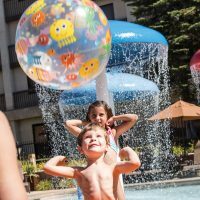 Families can easily walk to the day or night Minor League baseball games or even visit the ball park when there isn’t a game to enjoy the slide, climbing wall, restaurants and other fun amenities. Or from the comfort of your guestroom, you can enjoy the nightly fireworks displays that take place at the stadium in the summer months. Guestrooms with stadium views have an ideal fireworks viewpoint. The spacious guestrooms and suites feature a mini-fridge, microwave and complimentary Wi-Fi. The onsite restaurant, Champions, and the Bistro cafe are excellent options for families to enjoy breakfast, lunch or dinner. Kids will love the indoor pool and the adults will love the large outdoor patio and fire pits. 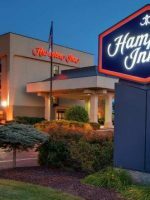 For baseball fans or for families who wish to be within walking distance to many of downtown Fort Wayne’s attractions, this is the place to stay when visiting Fort Wayne, Indiana. The 250 guestrooms and suites feature complimentary Wi-Fi. Cribs, rollaway beds and connecting rooms are available upon request. 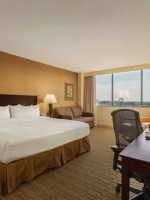 About half of the rooms offer pretty views of the Tincaps baseball park, which is prime viewing when there are fireworks displays in the summer. 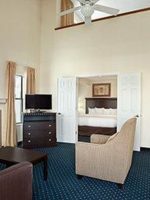 The guestrooms feature a king or two queen beds, a mini-fridge, microwave, coffeemaker and a flat-screen television. The bathroom features a bathtub or a stand-up shower, so state your preference when booking. Charging stations can be found next to the beds. The guestrooms with a king bed also include a sleeper sofa in the seating area. The suites feature a king bed with a sleeper sofa in a separate living room area (separated by a door). 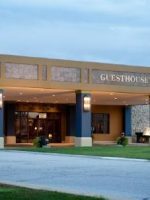 A mini-fridge, microwave, two flat-screen televisions and a coffeemaker are available, along with charging stations by the bed. We had about 30 families stay here for a wedding weekend. We ALL had a fabulous experience. From the sales dept helping with that many reservations to the front desk to the restaurant taking us in bulk throughout the whole weekend. They were accommodating and gracious the WHOLE time. Wonderful experience. Just call ahead and work with them for your large group.... they were awesome! Facilities were very clean and staff was very friendly. It was very busy when I checked in for a conference there was only one person working at the desk; however, the young lady was extremely professional and kept her cool. I tried Connors Restaurant and the Cobb salad was fantastic. 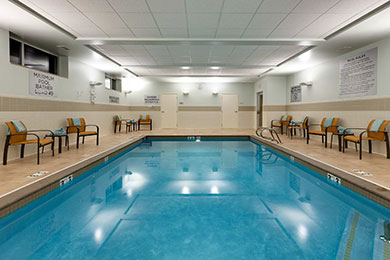 The small indoor pool, with 3- to 4-foot depth, is a great spot for families to spend some quality time. The kids can take a dip while the adults relax at the surrounding tables and chairs. The pool is open from 6 a.m. to 11 p.m. and pool towels are provided. The large outdoor patio space offers comfortable and cozy chairs and fire pits in the summer months. It is a great place to hang out before or after a Tincaps baseball game, which is only steps away from the patio. Families are welcome to charge any of their dining bills from the onsite restaurants directly to the room bill for convenience. Located just off the lobby, this onsite sports grill serves a delicious lunch and dinner in a family-friendly atmosphere. The game is always on one of the 30 televisions and the bar is open late for the adults. Champions is open from 11 a.m. to 11 p.m. on the weekdays and until midnight on the weekends. A kids' menu is available and in-room dining is available from here as well. This cafe-style bistro is situated in the lobby, just outside of Champions. Guests can choose from the made-to-order menu for breakfast from 6 to 11 a.m. Everything from fruit to breakfast sandwiches and eggs are available. Starbucks coffee is also available at The Bistro any time of day. If there is no one staffing the area at the moment and you are in need of some caffeine, just ask the front desk for some assistance and they will get you your jolt, stat! A small market area, offering snacks, beverages and frozen meals, is available 24/7 in the lobby. The fitness center, which offers cardio machines and weights, is open 24/7 and gym towels and water are provided. The cardio machines also feature individual television screens to plug your headphones. Parking, including in and out privileges, is available for a daily fee in a parking garage nearby. This large, interactive touch screen is located in the lobby and available for guests to find information about Fort Wayne. Restaurant and shopping suggestions can be found here, along with the weather, news or directions to any area attractions. The board also allows guest to check in to flights and print boarding passes. The summer months through September are the busiest at this hotel. January can also be busy, with several area events taking place. 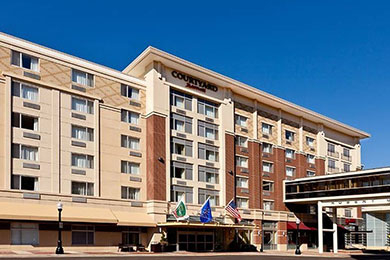 The Fort Wayne International Airport is about 20 minutes away from this hotel. Fort Wayne is situated about two hours north of Indianapolis and about two and half hours from Sandusky, Ohio. A free airport shuttle is provided for guests daily from 7 a.m. to 10 p.m., and making a reservation is suggested. Several restaurants are within walking distance to this downtown hotel. 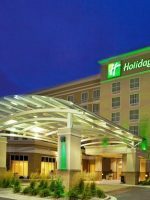 A Sky Bridge attaches the hotel to the Fort Wayne Convention Center and guests are steps away from the Tincaps baseball stadium. However, a vehicle would be needed to see things outside of the downtown area.